Lawyers for Wiedeking, left, and Haerter believe the charges will not succeed. BERLIN (Bloomberg) -- Former Porsche CEO Wendelin Wiedeking and ex-Chief Financial Officer Holger Haerter were charged with market manipulation over the use of options in a failed bid to take over Volkswagen Group. The indictment was filed after more than three years of investigations into claims Porsche misled investors in 2008 when it denied that it sought to buy VW. The company in October of that year disclosed a plan to take control of the carmaker. "The investigation found the suspects in February 2008 at the latest made the decision to increase Porsche's share in Volkswagen to 75 percent in the first quarter of 2009 to prepare a takeover," Claudia Krauth, spokeswoman for Stuttgart prosecutors, said today. In the period between March 10 and October 2, 2008, Porsche denied at least five times that it planned to increase its VW stake to 75 percent, Krauth said. The denials influenced VW's share price, she said. The Regional Court of Stuttgart now has to decide whether the case may proceed. Haerter is currently standing trial at that court in a related case claiming he and other Porsche managers made false statements when refinancing a 10 billion- euro loan. The part of the probe covering allegations of breach of trust was dropped because they couldn't be proved with the "necessary degree of certainty," Krauth said. The two men and Porsche have rejected the allegations. The charges won't succeed, Anne Wehnert and Hanns Feigen, lawyers for the two men, said in a joint statement. Dropping the breach of trust probe for lack of evidence is tantamount to an acquittal, they said. The allegations shrank during the probe from 14 to five cases of information-based market manipulation, they said. Prosecutors had dropped the part of the probe looking into trade-based market manipulation claims in February of last year. "We're astonished to note the prosecution with this indictment wants to side with unknown short sellers, of all people, who made highly speculative and irrational bets against the VW stock," the men's lawyers said. Albrecht Bamler, a spokesman for Porsche, said the charges apply to Wiedeking and Haerter, who are no longer part of the company, and declined to comment further. Porsche's denials in 2008 caused investors to sell Volkswagen shares and increase short positions, Krauth said. At the same time, Porsche started to prepare the bid by building up options, she said, citing the probe's findings. The men had been investigated for breach of trust because prosecutors suspected they put the company at the risk of bankruptcy with the options strategy. While the findings confirmed the number of VW options Porsche held in October 2008 would have exhausted Porsche's liquidity "multiple times" had the stock dropped, the prosecutor can't prove the men foresaw that risk when buying the derivatives earlier, Krauth said. "The likelihood of such a slump increased during the period the probed examined," Krauth said. "However, it was no longer possible to sell the options when such a slump was likely enough, because" Porsche then held too many of the instruments to exit the strategy. The company is also facing civil suits seeking more than 4 billion euros in a Braunschweig court over the issue. Similar cases are also pending in U.K. and U.S. courts. Plaintiffs in those civil suits have so far failed to get access to findings from the German prosecutors. They may now renew their bids. Any material they may get can also be used in the civil cases. Franz Braun, a lawyer representing plaintiffs suing for more than 2 billion euros combined in Braunschweig, said he will seek access to the files as soon as the court has ruled that the charges may go to trial. "The prosecutors' allegation are identical, including the dates, with what we say in our suits," Braun said. "That's nice, of course." Porsche and VW agreed to combine in 2009 after Porsche racked up more than 10 billion euros of debt in its unsuccessful hostile bid. 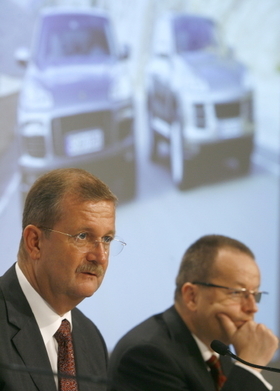 Wiedeking and Haerter left Porsche in July that year. A merger between the two companies was scrapped last year because of the lawsuits. To avoid further delays, VW purchased the Porsche auto business, completing the transaction on Aug. 1. The Porsche holding company remains a stock-listed company, whose sole asset now consists of its VW shares. "This is clearly negative news given that the case will necessarily take quite a significant length of time, and moreover could well be viewed as supportive for other related actions," David Arnold, an automotive analyst with Credit Suisse in London, said in an emailed statement today.